​President Barack Obama isn’t likely to hear many kind words from Republicans looking to succeed him in office. However, former Florida Gov. 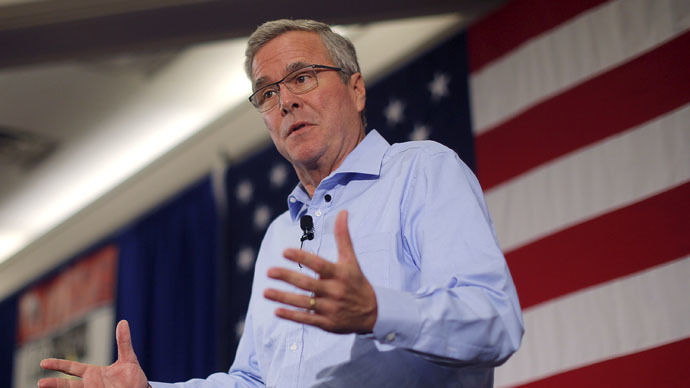 Jeb Bush is praising him for continuing a controversial surveillance program. Considered a frontrunner for the GOP’s 2016 presidential nomination, Bush recently said that Obama’s decision to keep in place the National Security Agency’s ability to monitor metadata – information such as when a phone call was made, who it was made to and how long it lasted – has helped keep the United States safe. Bush made the comment on Tuesday while appearing on “The Michael Medved Show,” a nationwide radio program, after he was asked what the “best part” of the Obama presidency has been. “I would say the best part of the Obama administration would be his continuance of the protections of the homeland using the big metadata programs, the NSA being enhanced,” Bush said. The legality of the NSA’s surveillance program has been hotly debated in the US ever since revelations by former government contractor Edward Snowden in 2013. Critics of the program argue that it violates the Constitution’s Fourth Amendment protection against unreasonable search and seizure, but supporters say it is crucial for combating terrorism. Provisions in the USA Patriot Act that provide the NSA with the authority to gather metadata are set to expire on July 1, though it’s unclear if lawmakers will decide to repeal or reform that ability, or simply renew it altogether. Elsewhere in the program, Bush agreed with Medved that Obama helped the GOP reclaim control of Congress over the course of two midterm elections, but dismissed the idea that racism is fueling the president’s critics.